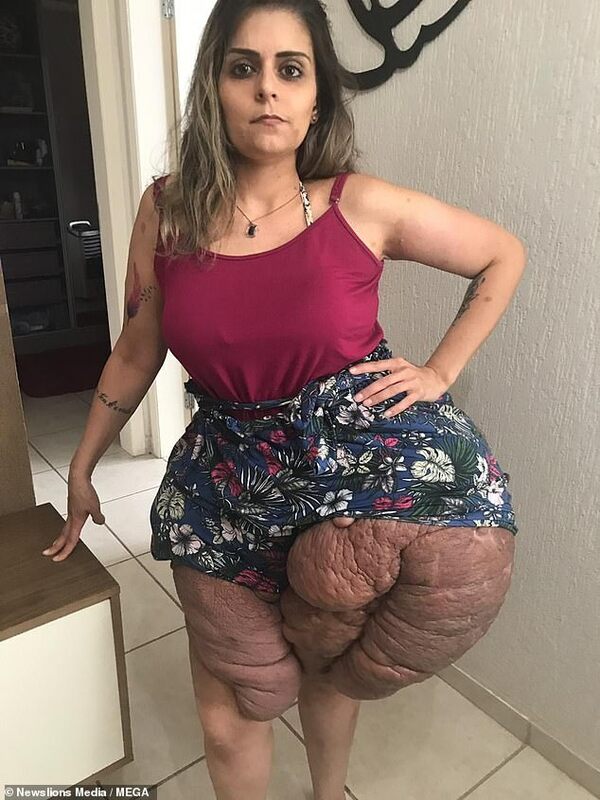 A woman with huge tumours growing on her legs and hips is desperately trying to find more than £32,000 to get treatment in India. Karina Rodini, 28, suffers from a condition called neurofibromatosis which has left her unable to work or find a boyfriend and barely able to leave the house. Now mostly housebound, Miss Rodini’s mother had to quit her job to look after her and she has been rendered an outcast in her neighbourhood in Sao Paolo, Brazil. She has had seven operations already and kilos of the giant lumps have been removed but she is no closer to living a normal life. Following surgery in a public hospital in October last year, Miss Rodini says, her legs have doubled in size and left her struggling to walk. She cannot find clothes to fit her, struggles to sleep because she is so uncomfortable and has worsening vision in one eye because of the condition. Despite her being diagnosed at the age of two and having a nine-kilogram cyst removed when she was 12, doctors haven’t managed to get the illness under control. ‘It’s been very hard to find a job because sometimes I have to get the day off to go for a doctor’s appointment,’ Miss Rodini said. Miss Rodini’s mother, Fatima, 58, said it has been ‘very hard’ to see the disease ‘consume’ her daughter. Miss Rodini has visited doctors in both Sao Paolo and the city of Curitiba, where she managed to find a surgeon who would operate. She has since had surgeries every two to three years but only around a kilogram of flesh can be removed in each procedure because she loses so much blood. Neurofibromatosis type one is a genetic condition which causes tumours to grow along someone’s nerves. The tumours it causes are soft and not cancerous, and the illness can also cause problems with the eyes and bones. It is usually easy to diagnose, the NHS says, but there is no cure. Treatment involves surgery to remove any growths, pain management and psychological support. Her love life has come to a standstill because of the illness, too. Patricia, Miss Rodini’s youngest sister, is studying in Canada and said the tumours have destroyed her sibling’s confidence. Miss Rodini has now found a hospital in India which is willing to try and tackle the entire of her growths – she says the waiting list at public hospitals in Brazil is too long and the family could not find a doctor they were happy with. Dr Ashwini Dash, a reconstructive surgeon in Indore, a city in the centre of the country, said: ‘This is a case of type one neurofibromatosis. Her problem area is the waist down to the knee in both legs. ‘We need to get a CT scan done to be able to understand the growth of the tumour and, once the CT scan is done, we can do a further diagnosis of the case. But Miss Rodini cannot afford to pay for the CT scan, let alone the approximately three million Rupees (£32,000) the medical treatment would cost. Her sister Patricia has started a GoFundMe page and the family hope to raise the money from donations. Miss Rodini said: ‘I am a forward-looking, optimistic person. The lumps can increase in number during a person’s lifetime. NF has also been linked to an increased risk of stroke if growths develop on nerve cells in the brain and cut off the organ’s blood supply.